To create a link to a URL outside your domain, begin by simply highlighting the word or phrase you would like to function as the link. Then, select the link button show, below in the content editor. You will see an Insert/edit link popup box appear on your screen, allowing you to type or paste in the URL to which you want to link into the URL bar. Note: The Insert/edit link popup box also allows you to indicate whether you want your link to load in the same window or in a separate tab. We typically recommend setting links to URLs outside your domain to open in a new tab so that users don't accidentally navigate away from your website. Once you've inserted your link and set up your options, click Insert and the word or phrase in the content editor should now be highlighted, with an active link established. Begin by highlighting the word or phrase you would like to serve as the link, and select the link button. After selecting the link icon, you will see an Insert/edit link popup box appear on your screen. Because you are linking content to another page within your site, choose the Pages drop down. There are two ways to find a page within your site. First, you may search for a page by typing in keywords. Once the desired page comes up, select the page you wish to link to. As a second option, you can easily navigate your site tree to the page you wish to link. To do this, select the Browse button next to the search bar. Navigate through your site tree to find the page you wish to link to. Once you've selected the page to which you want to link, click Insert to activate the link! To create a link to a file from your computer, begin by highlighting the word or phrase you would like to function as the link. 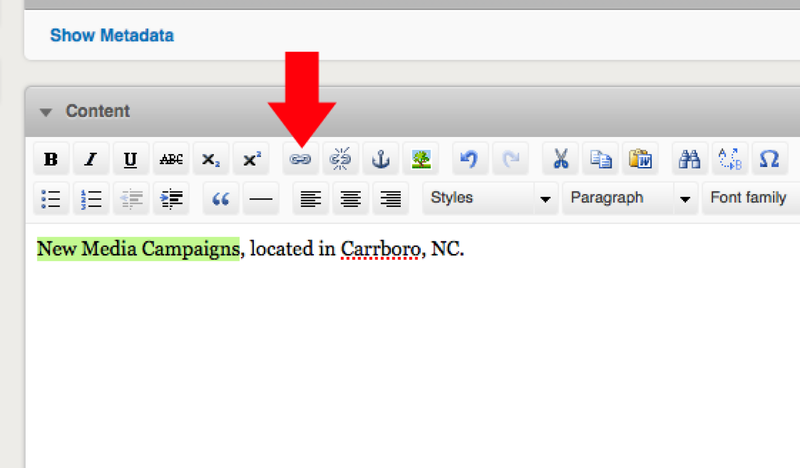 Then, select the link button show, below in the content editor. Once the uploader appears on your screen, select the Browse icon, to the right of the URL field (shown below) to choose your file.Moxicode File Manager will now appear on your screen. Click the Upload button in the top right-hand corner. You will be able to Choose Files from your computer. Find the file that you would like to place, select it and a choose Upload to Server. The file will now be shown in the File Manager. To finish creating the link, be sure that the file is checked in the File Manager, and select Insert (as shown below). Your file has been established as a link!